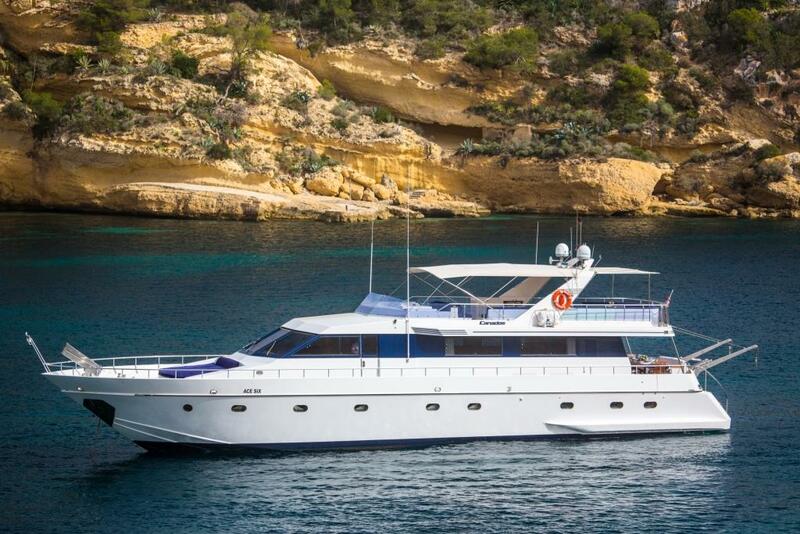 Motor yacht ACE SIX (Ex Mer Bleue) is a 27m (88,7ft) Italian Canados design that was built in 1987 and refitted in 2013. 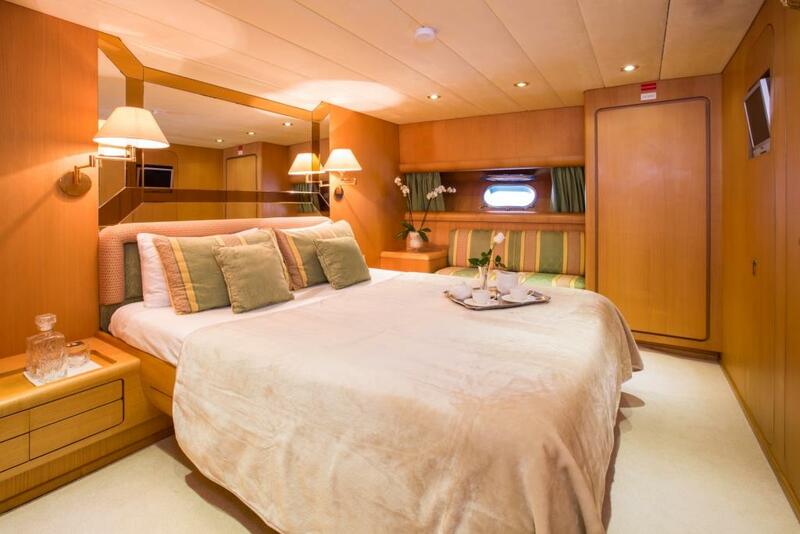 She offers accommodation in 4 spacious cabins, for up to 8 charter guests. 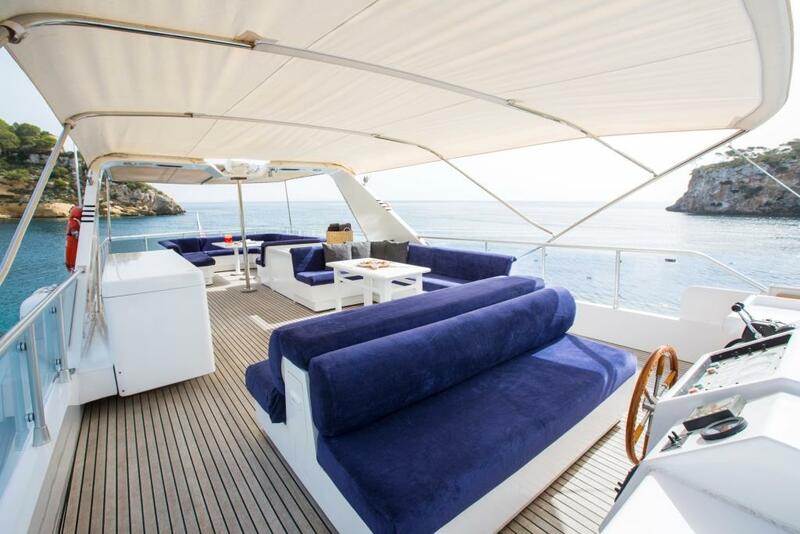 Her contemporary interiors are light and airy throughout. 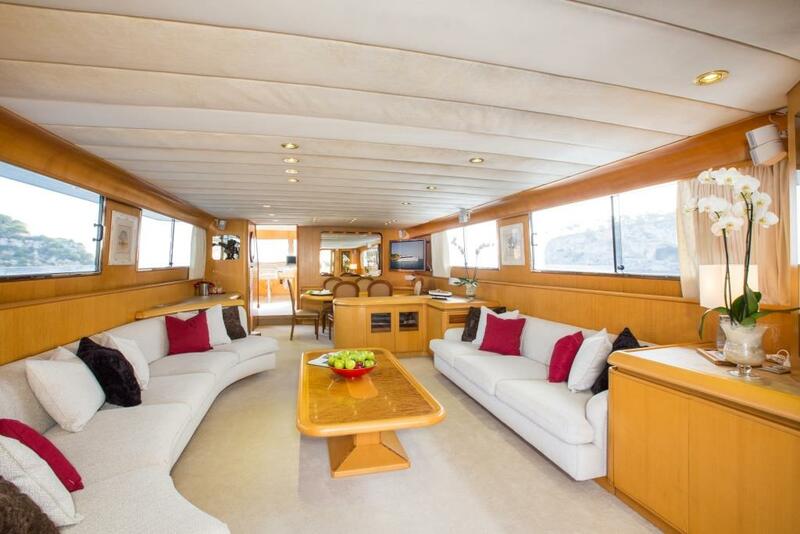 The main deck has a generous open plan salon and dining, with the lounge aft and formal dining forward. 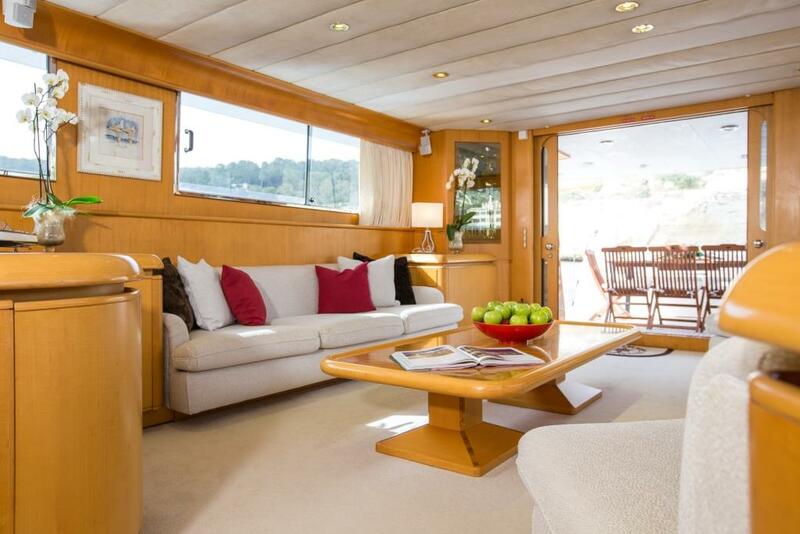 The décor is stylishly timeless, featuring honey toned woods and neutral soft furnishings. 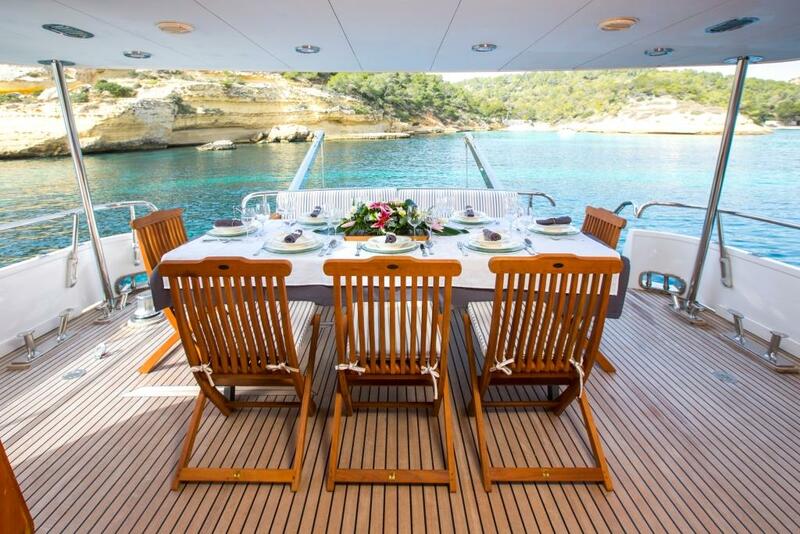 Panoramic windows ensure natural light and endless views. 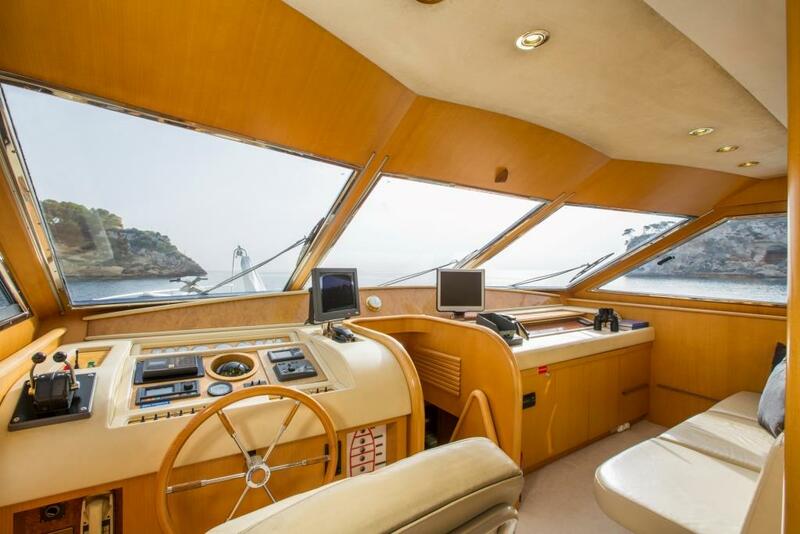 The bridge deck is forward of the salon and is the perfect spot to get a captain’s eye view of the surroundings. 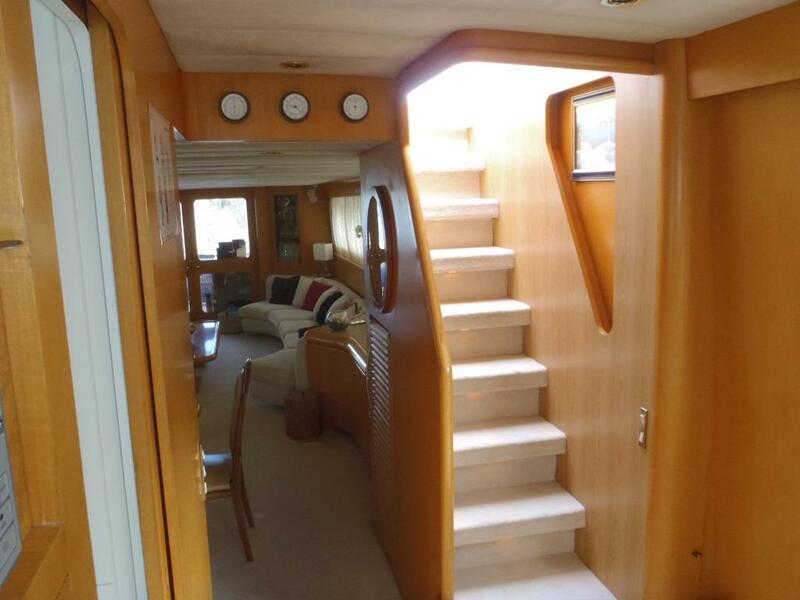 From the bridge, there is direct interior access to the sundeck. 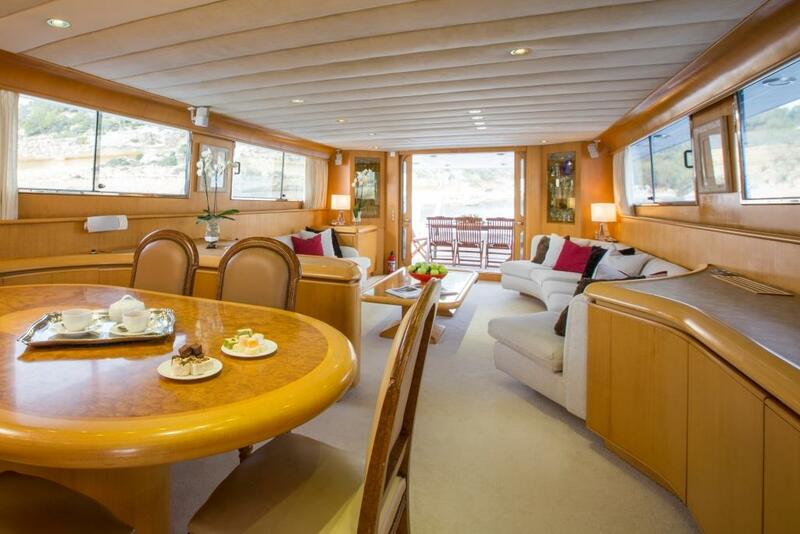 On the lower deck are 4 guest cabins, each offering private ensuite facilities. 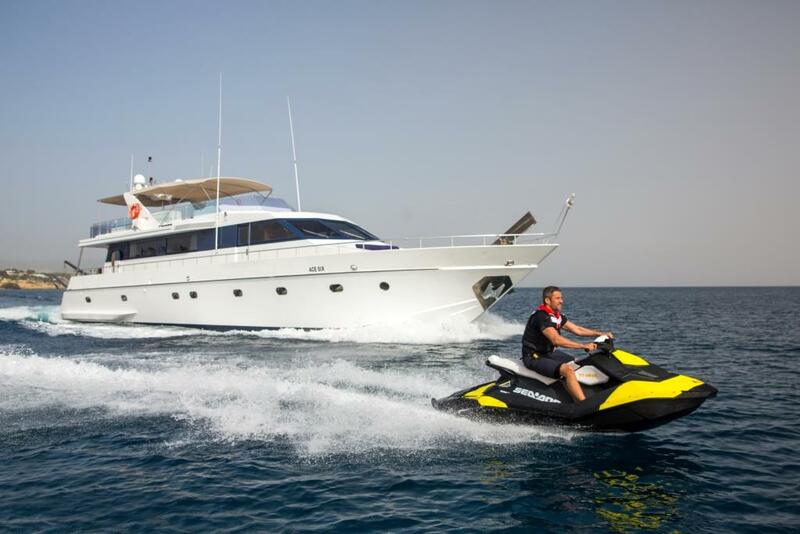 The yacht boasts plenty of exterior living over 2 decks, along with an extended swim platform, ideal for easy water access, to enjoy the toys on offer. 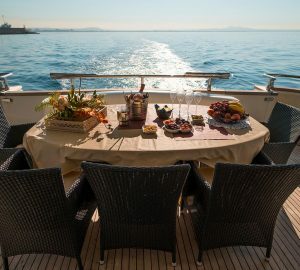 The aft deck is adjacent to the salon and has shade, built in seating and an alfresco dining table. 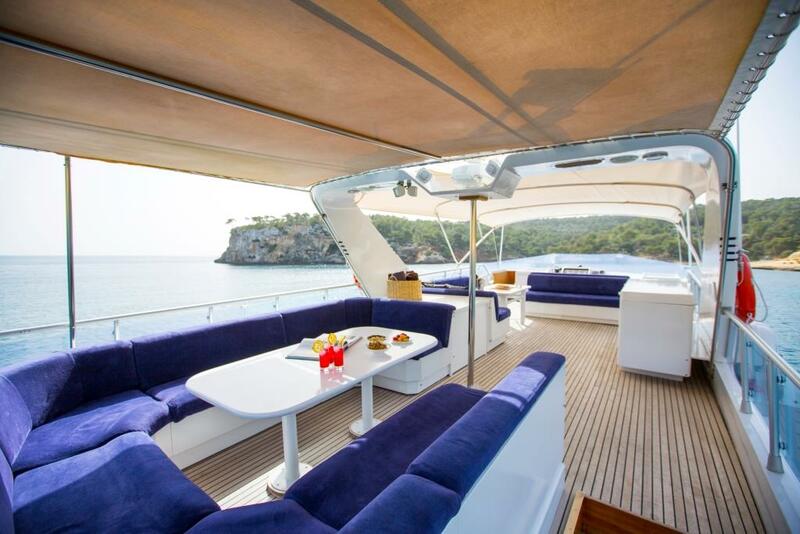 Her main deck wraps 360° around, providing wide side decks forward to a raised sunpad area. 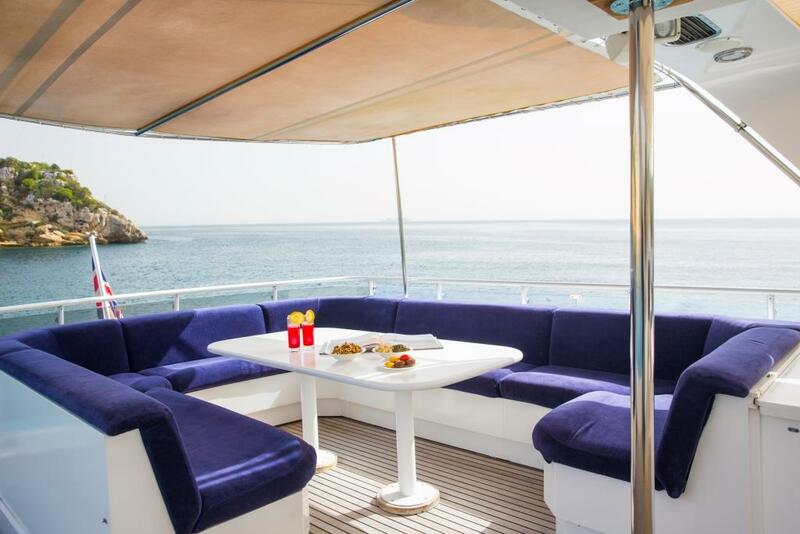 The upper sundeck is a great attribute, complete with an abundance of seating, 2 alfresco dining tables, service station, optional Bimini shade and captain’s helm station. 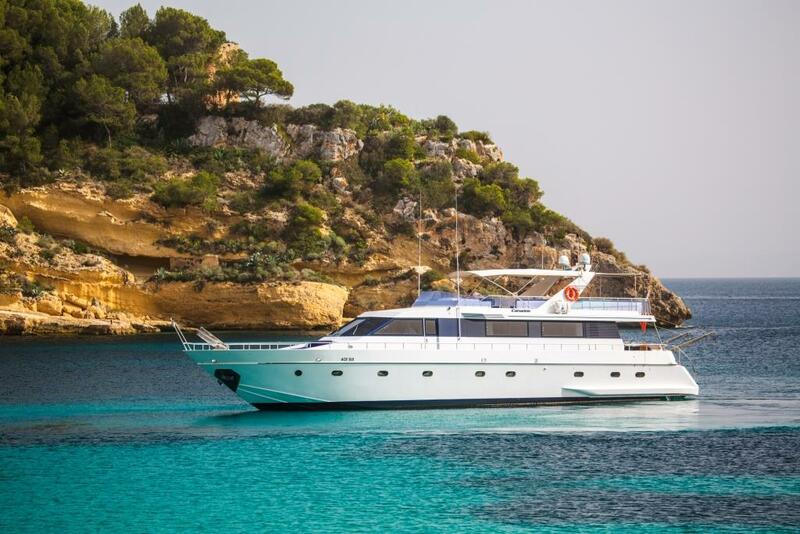 Canados yacht ACE SIX is powered by twin Detroit 1,080hp diesel engines, producing speeds of 10 – 14 knots. 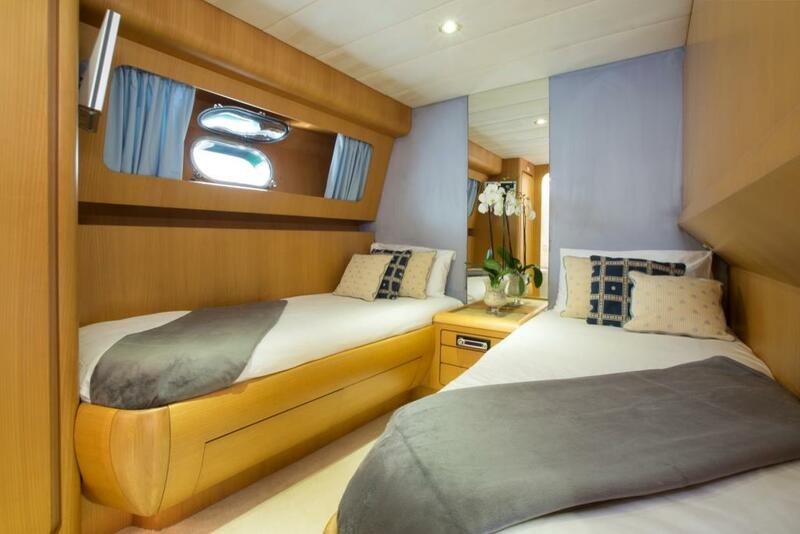 Guest accommodation is on the lower deck in 4 ensuite cabins. 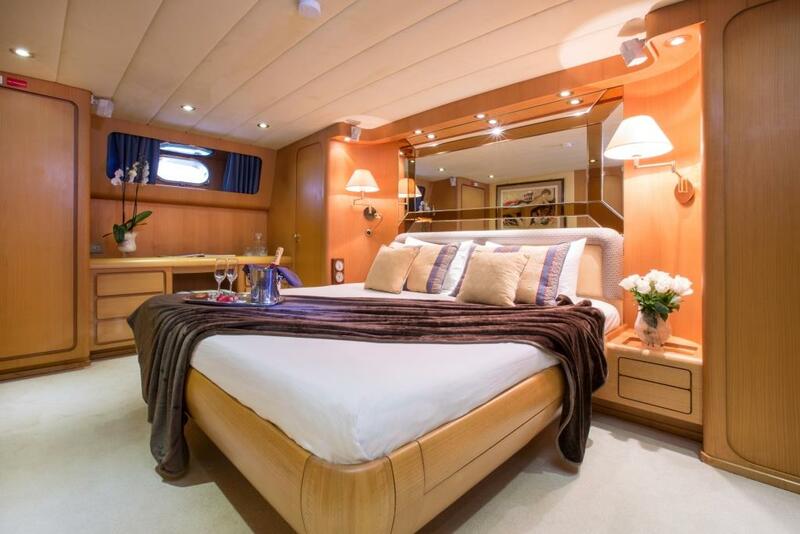 The master cabin is amidships and full beam of the yacht, with a large double bed, sofa, mini fridge, walk in wardrobe and ensuite with dual sinks. 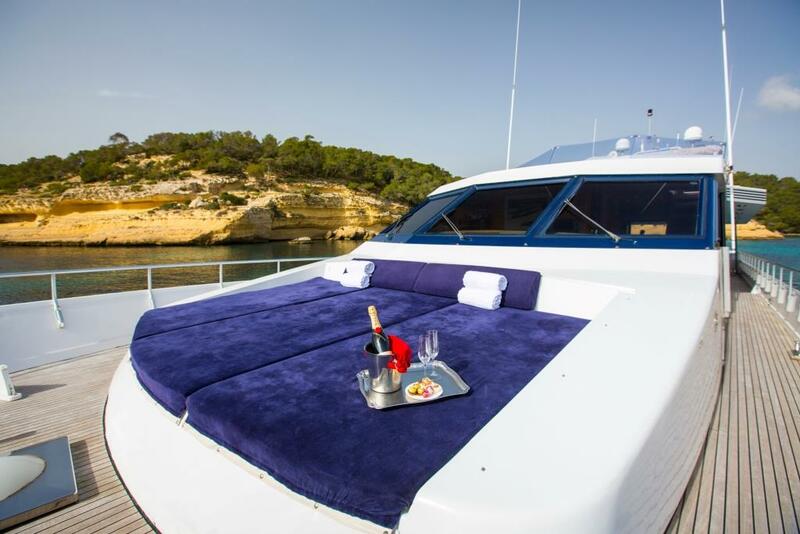 The VIP cabin is forward and full beam of the yacht, with a large double bed and sofa. 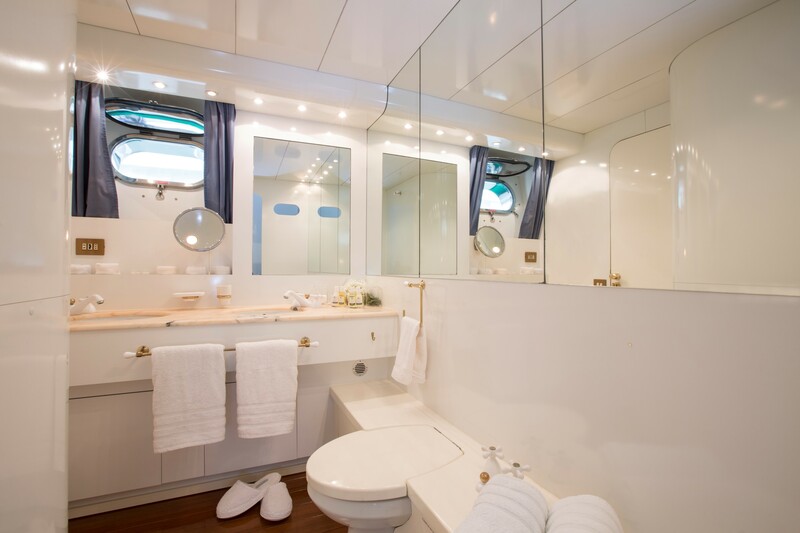 Two cabins each have twin beds and an additional Pullman berth. 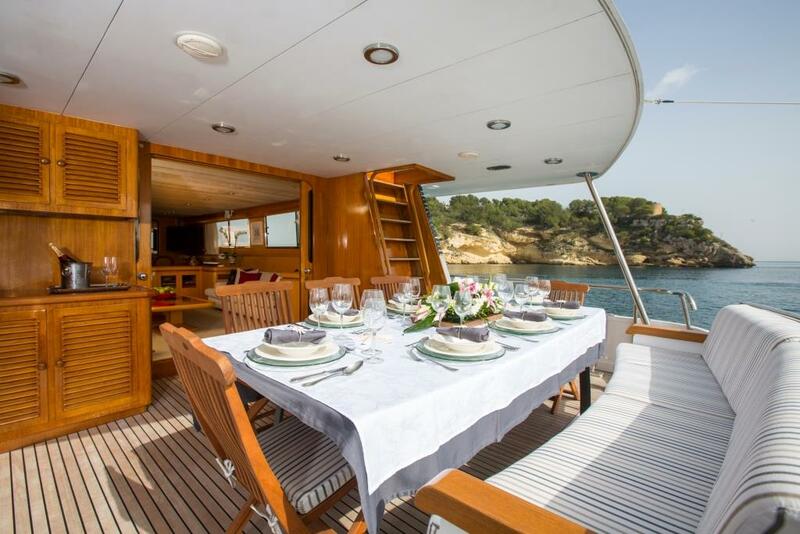 All cabins are fitted with entertainments systems. 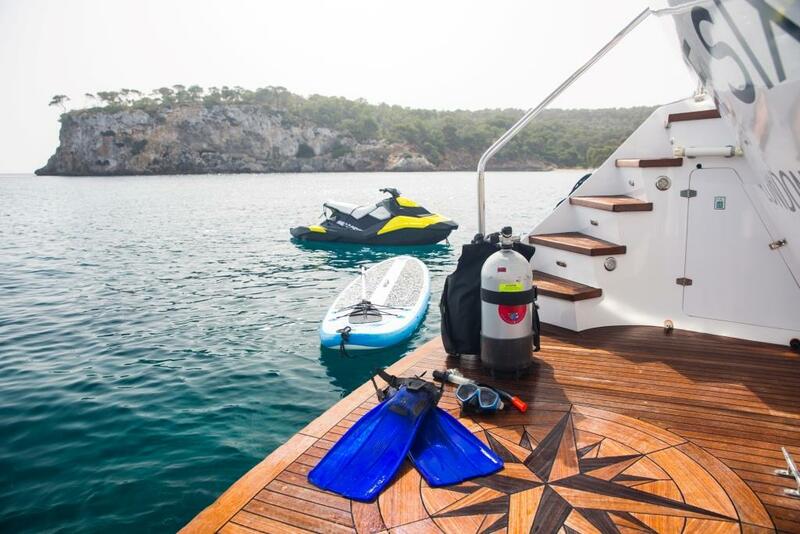 ACE SIX offering the floowing Tenders & Toys: Tender 5.5 metres with 50HP Mercury outboard 1 x Jetski Seadoo Spark (2015) 3m Dinghy with 5HP Yamaha outboard (2013) Doughnut Wakeboard Water skiis SUP (stand up paddle board) Fishing gear: 2 sets Snorkelling: 10 sets incl flippers Diving equipment: 4 complete sets with breathers/life jackets/wetsuits Communications VHF Wifi Audio Visual Equipment and Deck Facilities Bose surround system in main saloon, 40 inch LCD TV (Hitatchi), DVD, Sony PlayStation, wine cooler, ice maker.